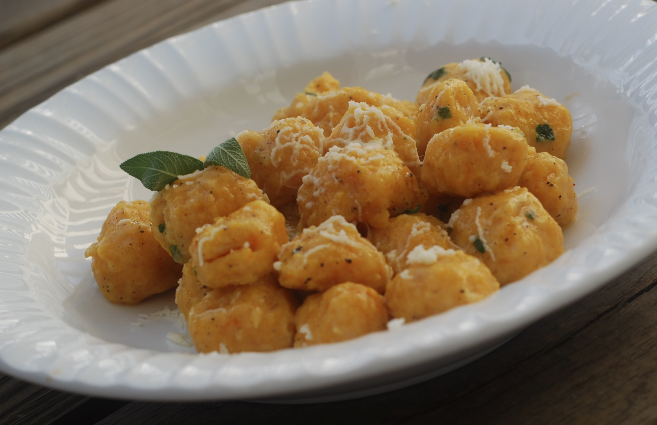 If you like gnocchi, you should try these! For making the gnocchi: To make the butternut squash purée, you may follow the same instructions for pumpkin found here. When you have your purée ready, place it on a lightly greased (1/2 tbsp olive oil) saucepan and cook over medium heat stirring constantly until liquid evaporates. Set aside to let cool. Once the purée is tepid, beat the egg in a separate medium bowl; then add the squash, 1/2 cup Parmesan, nutmeg and salt, mix everything together. Gradually add the flour, one cup at a time until the dough separates from the side of the bowl. Transfer to a floured surface and knead gently. Only if it is very sticky, you may add flour; it is normal for it to be sticky; if you add too much flour they will end up tasting more like flour and less like squash and the consistency would be affected too. Roll the dough and shape it like a rope about 1.25cm (half an inch) thick. Cut out pieces about 2cm (3/4 inch) long. Take each piece and roll through a ridged wooden board (if you have one) or use the back of your fork as shown in this tutorial. Transfer the gnocchi to floured surface. For cooking the gnocchi: Heat water in a medium pot until it boils, add salt. Cook about 1 cup of gnocchi at a time until the gnocchi float, about 4 minutes. While the gnocchi cook, melt butter in a skillet, add salt and pepper and chopped basil leaves. Once the gnocchi are cooked, transfer to the skillet to coat them with the sauce. Serve warm, sprinkle remaining Parmesan cheese. Source: Adapted from Iowa Girl Eats. Disclaimer: we are not promoting a brand nor are affiliated with Amazon, HIC Brands That Cook, All recipes or YouTube. We have included the links only for demonstration purposes. Categories: Recipes, Squash | Tags: gnocchi, Italian, main course, vegetarian | Permalink.